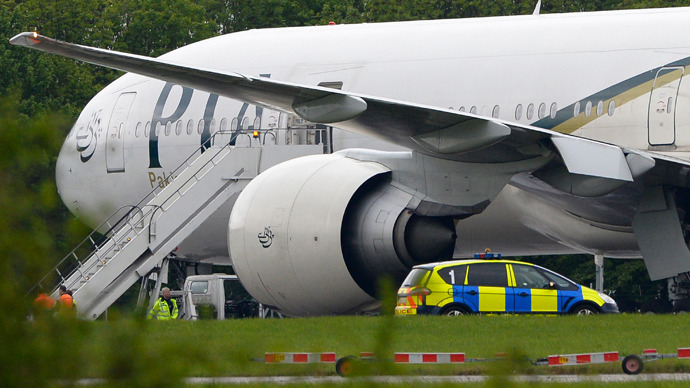 British police have arrested two men on a Pakistan Airlines airplane after RAF Typhoon fighter jets escorted it from Manchester Airport to Stansted Airport near London. The plane was carrying 308 passengers and 14 crew from Lahore when it was rerouted. Flight PK709 was due to land at Manchester Airport in northwest England at 14:00 BST, but was diverted over York and escorted back over the North Sea and down the coast to Stansted by Typhoons sent from Coningsby in Lincolnshire. Once the plane was landed and escorted to an isolated runway, officers from Essex police boarded and detained two British men, aged 30 and 41 for questioning. Although the men were taken on suspicion of endangering the plane, police said they were treating the incident as a criminal offence and not terrorist related activity. The incident is believed to have happened about ten minutes before the plane was due to land in Manchester. The pilot was concerned about a disruptive passenger on the plane and requested air traffic control to divert to Stansted. According to witnesses the plane crew received numerous threats including unconfirmed reports of bomb threats. “We were about half-an-hour away from landing in Manchester and we saw the plane was taking different actions,” one of the passengers told the BBC. Another passenger said that two men had repeatedly tried to get into the cockpit. “The cabin crew informed us that basically they tried to come into the cockpit a few times and they got into a bit of an argument with the crew and made a few threats,” Umari Nauman told Sky News. Pakistan International Airlines (PIA) later explained that the incident was a result of a family argument during the flight. "There was a family of eight to 10 people on the plane and they were quarreling among each other. When PIA staff approached them and asked them to calm down, they told them to go away otherwise they would blow up the plane,” the PIA source said, according to AFP. Pakistan International Airlines said there were 308 passengers on board, as well as 14 crew including pilots, with a mixture of Pakistani and British passport holders. The airport confirmed that no one was hurt in the incident and all the passengers left the plane safely, but were asked to leave their possessions on board. An MoD spokesman said the incident was now a police matter and that the military’s "involvement was over” since the plane was grounded. Superintendent Darrin Tomkins of Essex Police told reporters that they were treating the incident as a criminal offence and not a terror related incident. A spokesman for the airport meanwhile said that police might want to interview some of the passengers for more details on the incident. The plane diverted to Stansted is apparently the same aircraft, on the same route, that was diverted to Stansted in September 2011 due to a bomb scare, AFP said.